Running can be a pretty brutal sport. Rare is the runner who goes his or her whole life injury-free. For some it’s their ankles, others their knees, and still others their hips. For this reason, extra attention is required to ward off the injury bug and stay on the streets. If I had it my way, every runner would do heavy strength training twice a week in order to stay strong and stable and fight back against all that repetitive pounding. But I know runners. They’re a stubborn bunch. With all the time they’re already putting in, they definitely can’t be bothered to get to the gym to pump iron. Nor do most of them even particularly enjoy it, for that matter. As such, here are some warm-up/cool-down strategies for the non gym-going runner that, with good compliance, will reduce injury and help runners maintain their mileage. Ever notice how it takes the first few miles to really get into a run, both mentally and physically? Taking 15 minutes before the run to get into the right frame of mind and body can make all the miles that follow that much more productive. To improve the quality of your muscle tissue without the aid of a massage therapist, all you need is a golf, tennis, or lacrosse ball and a foam roller (or $5 PVC pipe in the same shape from Home Depot if your pain tolerance is high). Spend a few minutes rolling around on your toys. Get the bottoms of your feet; your backside; upper and lower back; thighs (back, outer, front, inner); and lower legs. Feel free to linger on tight spots or use broad strokes, whichever feels right. 2. Proceed to dynamic stretching. Due to its potential for performance impairment, static stretching should be saved for post-workout. Dynamic stretching — the active movement of muscles through their full range of motion — should be used in its place for its potential performance-enhancing effects. When you run, chances are you don’t think about extending your hips with your glutes, pulling your toes up with your anterior tibialis, or stabilizing your core with your deep abs. You just do it. The trouble is, this coordinated movement of upper and lower extremities about the trunk occurs so quickly that it’s nearly impossible to tell when something is awry. As such, it’s important to get the brain signaling to all the right muscles before taking your first stride. Perform enough reps to feel loose but not so many that you fatigue. 4. Finish warm-up with central nervous system activation. Just like you have to stimulate your muscles ahead of time, you also have to fire up the neural pathways that promote proper running mechanics. Don’t just sprint your last mile and immediately proceed to the kitchen for a sandwich. Instead, spend the extra ten minutes gradually backing off in intensity. Your body will thank you later. Jog for a bit; then walk until your breathing and heart rate is back to near resting level. Now you’ve earned the right to do your static stretching. Feel the euphoria! Don’t just do any old static stretches, though. Focus on the ones you really need. Below are a few that fit the bill for the majority of runners. Don’t mess around with old sneaks. Due to the repetitive pounding of the sport, professional triathlete Dan Feeney recommends re-upping on footwear every 300 miles. For those keeping score at home, if you run an average of 12 miles per week, that’s about every six months — and even more frequently for higher volume runners. Recently, the pendulum has swung all the way from barefoot and minimalist footwear to so-called “maximalist” shoes, which help dissipate forces more effectively than regular running shoes. Every shoe has its merits and drawbacks in terms of the striking pattern it promotes. What works well for one runner may contribute to injury in another. How do you know what’s right for you? Try each iteration out for yourself. No matter whether you’re transitioning towards minimalist, maximalist, or back from one extreme to the middle ground, be sure to make the change gradually (i.e. a quarter-mile at a time). 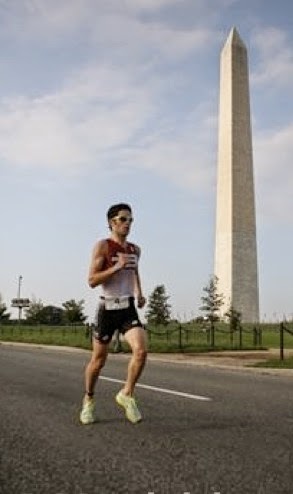 Pro triathlete Dan Feeney re-ups on sneaks every 300 miles, and you should, too! Magic, or Thai Style Bodywork?